SCOTTeVEST’s unique selling point is pockets. They produce jackets, vests, trousers and shirts with lots and lots of pockets. I love this idea. I normally carry a handbag every day, but don’t usually have to carry it all day. I go to work, where I put it down. I carry it to do grocery shopping, but then put it down when I get home. The problem, when I travel, is that I’m out and on my feet all day, and carrying a handbag isn’t pleasant for that long. Carrying it on my shoulder, I end up with shoulder and/or neck pain; on my back, back pain. In foreign, unfamiliar cities, I also get a bit paranoid about pickpockets so I end up clutching my bag all the time. That’s why, in order to be able to carry all those necessities that I normally schlep around in my handbag, but without carrying a handbag, I bought a travel vest by SCOTTeVEST (Yes, that’s how it’s written, as if someone’s shouting.). SCOTTeVEST promotes itself with the slogan “Our pockets … your freedom.” The pockets are mostly on the inside, zippered and secure, which makes it very hard to pickpocket. In theory, at least, it also doesn’t draw as much attention to your status as a tourist as bulging pockets on the outside would. I was told more than once, however, how “American” I looked in it! I chose a vest-style rather than a jacket because at that point I was planning a trip to Israel and Jordan in the summer, when it can top 40 degrees most days. I’ve since also used it on my solo trips to the Caribbean, Hong Kong, Singapore, Japan and South Korea, also during hot weather. Despite all these things in the pockets, it wasn’t very obvious from looking at it. The most visible bulges were in the two outside pockets, where all I carried was my pocket camera. Everything else rode on the inside, mostly invisibly. Presumably this makes you less of a target for pickpockets, and, even if they tried, they wouldn’t be able to access the pockets, since they all close well. 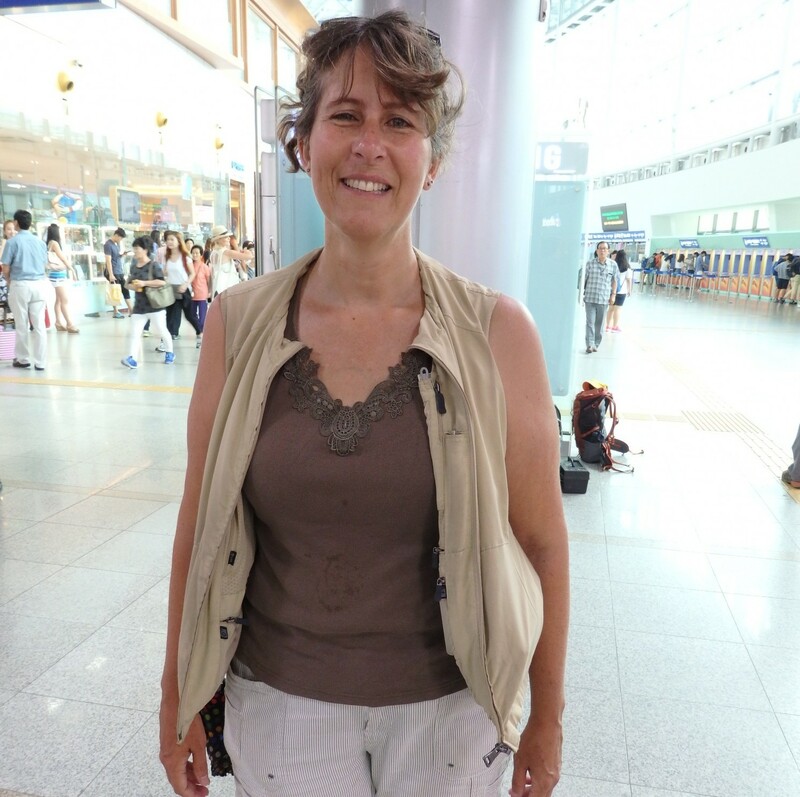 I didn’t realize how safe from pickpockets (the kind who use a knife to cut bags or clothing) this travel vest was until I was in Hong Kong and decided to get the collar sewn down (more on that below). The tailor broke three needles trying to do it, and gave up. He said even heavy-duty needles wouldn’t go through this material. In any case, it was a delight to be able to wear all of these things on me and a) not have to worry about pickpockets and b) have my hands free! However, I experienced some considerable negative aspects of this travel vest. It was hot! It might have been “just” a vest, but the material is some sort of polyester, I think, and does not breathe at all. In 40 degree heat, I sweated in it, even though I never zipped it closed. The neckline didn’t work for me. It has a small collar that stands up. The idea is that you can feed your headphone wires into the collar so that they’ll stay put and the earbuds will hang on either side, ready to use easily and quickly. I don’t use earphones. I can’t imagine blocking out the soundtrack of whatever place I’m visiting! I want to hear, as well as see and smell, the places I visit. The collar, then, was in the way. It made my neck sweat, and I ended up tucking it under to get it out of the way. You can see how messy that looks in the picture above. I never expected the vest to look beautiful, but this spoiled the cut of the vest even more. The weight was a problem. Obviously, I knew I was shifting all the weight that was usually in my handbag to my body. I didn’t mind that. It’s just that all of the weight was on the front, so the vest pulled down in front, which meant pulling down on the back of my neck. There is one pocket on the back of the vest, supposedly for a tablet. I don’t think it would have fit my tablet, a Surface, but in any case I couldn’t use it because I couldn’t reach it. I did use it a few times in Israel and Jordan for things like maps and leaflets, but I was dependent on members of my family to put things in or take things out. Otherwise I had to take off the vest to access that pocket, which would defeat the purpose of its pickpocket safety. I could just imagine taking it off on the street somewhere and having some passing thief grab the whole vest out of my hands. It seems a missed chance. SCOTTeVEST could have pockets pointing backwards, toward the small of the back. Access would be along the side seams. That would be a useful spot, and would allow some of the weight to shift back to offset all the weight on the front. And since the pocket on the back is so useless, it would have been far more comfortable to use some breathable fabric or netting on the back panel to bring the temperature down. I bought a size large, by the way, which fit me when the vest was empty. When I filled it with my things, I could not zip it up anymore. This didn’t really matter, since it was too hot to wear it zipped up. The vest comes with a chamois cloth for cleaning glasses, attached by a string into the glasses pocket. I loved having that available, both for glasses and for my camera lens. However, it’s sewn in in such a way that every single time, without fail, that I tried to pull glasses out of that pocket, the string got tangled up in the glasses. A little thing, but it got annoying. Inside one of the outer pockets is a wide elastic strap for holding a bottle. I could not find any standard size bottle that would fit into that strap. Once I managed, by taking off the vest, to wrestle a bottle into it, stretching the strap to its limit, but, since the strap is inside the pocket, the bottle deformed the whole vest to such an extent that it bulged very oddly and made it sit uncomfortably on me. You might also be interested in my review of my Eagle Creek rolling backpack that I used on my solo trips. SCOTTeVEST sells lots of other models, with various numbers of pockets. Many of these are jackets rather than vests, so they’d work in cooler weather. If you’re using the jacket for pickpocket prevention, however, as I was, what do you do when you’re inside? You have all of your belongings tucked away in hidden pockets of your jacket, but you want, say, to spend a few hours in a museum, or go to a restaurant. Do you keep the jacket on, or carry it in your hand? In that case, it’s no safer than your handbag would have been. Another option would to buy an even bigger size vest and wear it over a jacket. Then when you took the jacket off inside, you could wear the vest over your inside clothes. Not a great option because it would look odd over the jacket, but it would work. If you look at SCOTTeVEST’s website, it becomes clear that their products aren’t really intended for long-term travel. They gear their products more toward shorter-term trips, particularly hunting or fishing. Some are just meant to be everyday clothing. These products seem more suited to these uses. Certainly, if you’re going to be out all day hiking or whatever in, for example, autumn weather like now, one of their jackets would be perfect for comfortable, hands-free walking. Baubax is coming out soon with another similar product, but more geared to a travel market. Hopefully they’ll avoid some of the pitfalls I list above, and perhaps their materials will be more breathable. I hope so, because I doubt I’ll use my SCOTTeVEST much again. It’s too bad, really, because I loved having my hands free, and I loved knowing my things were right there and wouldn’t be stolen. Disclosure: I bought this vest at full price and this review is my honest assessment. great photo of you! I think that is genius having a travel vest. I haven’t even thought of it. Usually I have a backpack which is hell on my back but at least I have two hands free. I agree a shoulder bag over a whole day of travelling just gives you a shoulder ache. Yes, I usually have a backpack and have the same problem, which is why I bought the vest. 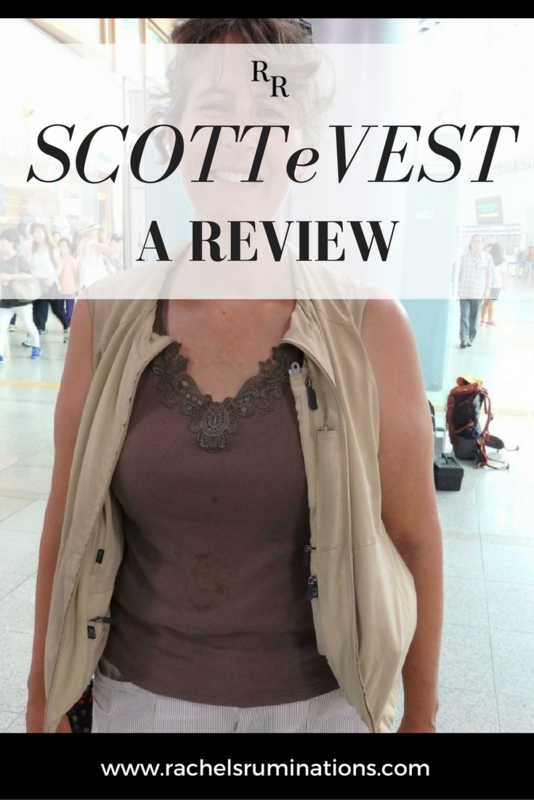 I bought the women’s 11-pocket Voyager vest from Travelsmith for a trip earlier this year, and liked it a lot. It had some of the same issues — a bit warm, and it could weigh you down if you jam a lot in the pockets. I still use it occasionally for running errands on the weekends if I want to go hands-free. I did think it marked me as an American tourist when I was on the trip. If you just wear it for an errand, it doesn’t seem worth it to me to transfer all my stuff from one to the other. Or do you just grab wallet and keys and that’s it? I asked for one of these vests a few Christmases ago and had the same problems you did. The weight pulling it down in the front seemed to put a weird pressure on the back of my neck that made me a little nauseous. I did find a water bottle that fit, but it bulged out a lot. The heat wasn’t so bad as it wasn’t all that hot outdoors. However, it is VERY nice to have my hands free and not worry about a bag dangling off my shoulder. I think it’d be very handy when going to places that don’t allow bags and make you leave them at the coat check. I’ll bring it along on my upcoming trip to Washington DC where most of my time will be inside museums. However, I may end up leaving it in the luggage after the first day if it’s too uncomfortable. It was also nice going through airport security. All I had to do was take off the vest and put it in the bin. and I loved having my hands free too. I think the best solution is the least fashionable: a fanny pack, worn on the front. But they’re so awful looking! Your review was really detailed and I appreciated this. I had always wondered what the vest or jacket would be like. Doesn’t sound comfortable or attractive. Thanks for helping me avoid buying it! As I wrote, it would work in some situations, and it was nice to have my hands free, but the disadvantages outweighed the advantages. If you find something better, please let me know! Rachel, there is a solution to the glasses wiper problem. That pocket continues to the underarm, and then has a little pocket there where you can stuff the glasses wiper and it will stay there. These pockets need to be explored to get the most out of them. I have emailed the company to suggest they post a video, or have a blog, or a set of instructions. I’d like to know the possibilities of wiring. Also, the front outside bottom pockets go all the way up, so technically you could fit a bottle of wine in there, without using the elastic. But it might come in handy some time. Thanks Lyn. I wrote this a few years ago so they might have extended the drink pocket upwards on later models. I’ll have to check it to see if I can find the little pocket for the glasses wiper. Does it tuck the string out of the way too? Curious if you had zipper issues with your Scottevest. I have gone through numerous of their products. Love the pockets. Hate the zippers, and the company has VERY poor customer services responses to faulty zippers. No, the zippers work fine on mine! I own their sport coat and just received a “Revolution Plus” today. Love ’em both. Just don’t fill up all the pockets as once or they will make you look like your a shoplifter … but there are truly more pockets then you would normally need (and I believe that’s the idea). The Rev Plus and the sport coat will hold a laptop or an iPad and you wouldn’t notice. I can imagine all the “extra” pockets being handy at an airport if you take “too many carry ons accidentally” or one of your bags is over weight. It’s very useful at the airport. Just take it off, put it in the bin they provide and you’re done. I’m curious, though: what do you do with a SCOTTeVEST jacket or coat when you’re inside, e.g. in a museum? Thanks for the review, just curious did you ever get the Baubax? Do you think it’s a better jacket? No, I never did. But I’ll look into it! i bought a jacketed from Scotty, yes i loved all the pockets and everything about it. Yet one of my zippers got stuck with the inside lining, when i finally removed it the lining was torn. also the stitching on one of my pockets came apart, so now i have a hole that drops my things into the lining. I expect a jacket that cost over $70 and up to last much longer then 6 month (with very little wear). I called them and their solution was to take it to a seamstress and have it repaired and to send them the bill (get a third party involve really. I hate this type of customer service, they don’t get that my time is worth more then a $200 jacket. I think i will stick with Columbia Jackets they too have many pockets but much better stitching. Thanks so much for your very detailed review. I’ve been looking at buying the new Featherlight vest for my next overseas trip. Your review certainly got me thinking as to whether it would be a good idea or not. I ddon’t like the way it looked on you (sorry, don’t mean to offend) especially around the neck. Perhaps they have improved their styling since you bought yours. For me to spend such a lot of money on buying it and shipping it to Australia, I really have to be sure it is what I want and I find I am talking myself out of it. Thanks for saving me about AUD220!! I don’t think you can expect a travel vest to look particularly good, at least not when it’s loaded up with all your essentials. But I did find it really useful and it was great to have my hands free. I recently took it to a tailor and had the collar removed, so I’ll be trying it out again this coming summer. I’ll probably write another post about it after my trip. In any case, it was a few years ago that I wrote this, so I don’t know about their other styles, and whether they’ve improved it.